Thanks for giving the City of Boston something to celebrate the year we needed it the most! Since the Marathon bombings, the Sox have given everyone in this city something positive to look forward to and to come together as a community for. Even the phrase “Boston Strong” is attributed to Red Sox player Will Middlebrooks, who tweeted it to his followers in the days after the bombings. 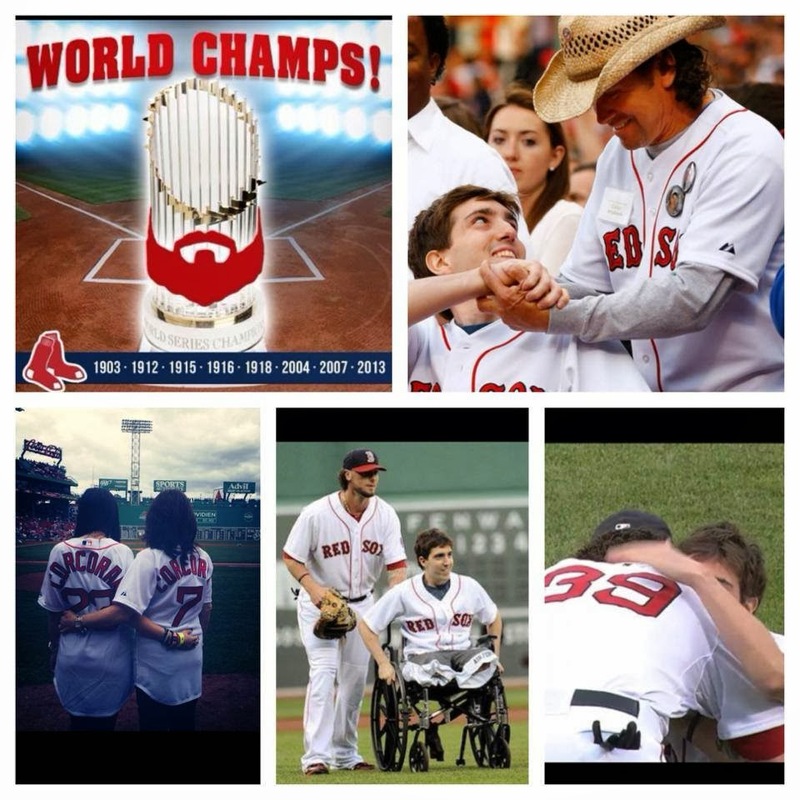 Read more about how the Red Sox reached out to victims after Marathon Monday and raised the spirits of the whole city of Boston in this ESPN article. Suffice it to say, our Red Sox players are not only talented ball players, they are good guys and great role models for our kids. 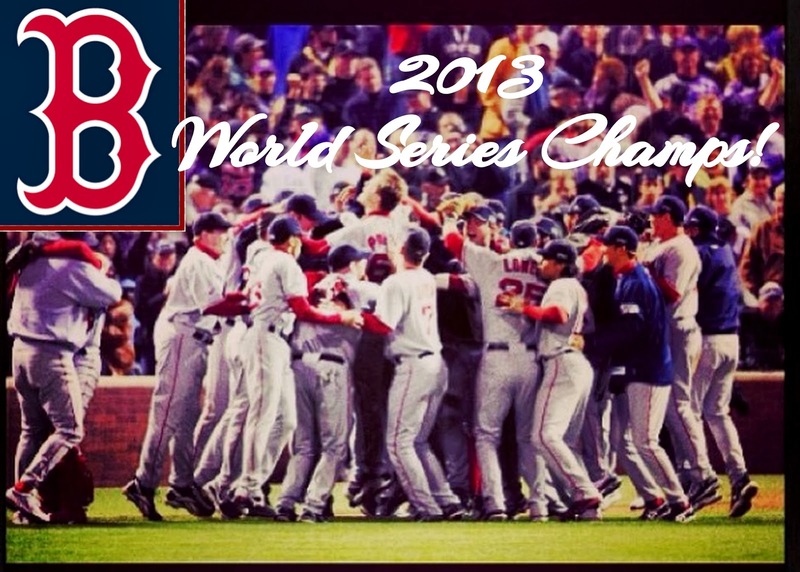 Last night the Sox went from worst to first, winning the first World Series in Fenway Park since 1918, and giving Bostonians something awesome to celebrate in 2013!! I’m so proud to be a Bostonian! 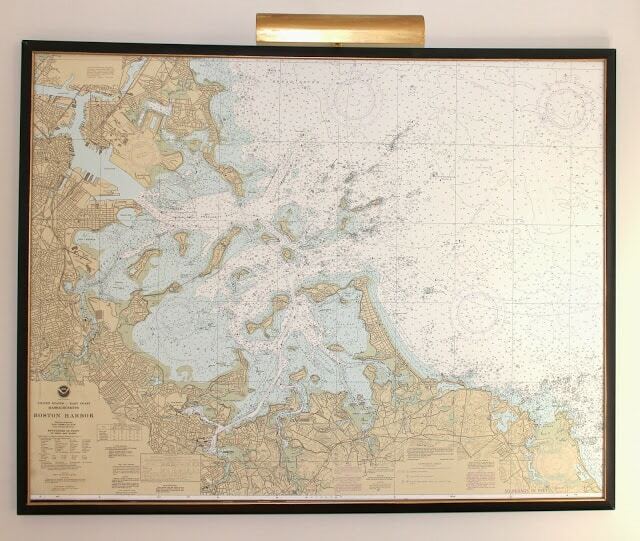 In keeping with the Boston theme today….how about I show you how I framed that big map of Boston Harbor?? It’s Week 5 of The One Room Challenge, and I am toiling away on the details of the basement (or rather, the piece of the basement I am working on for this 6 week challenge – mainly the TV wall.) 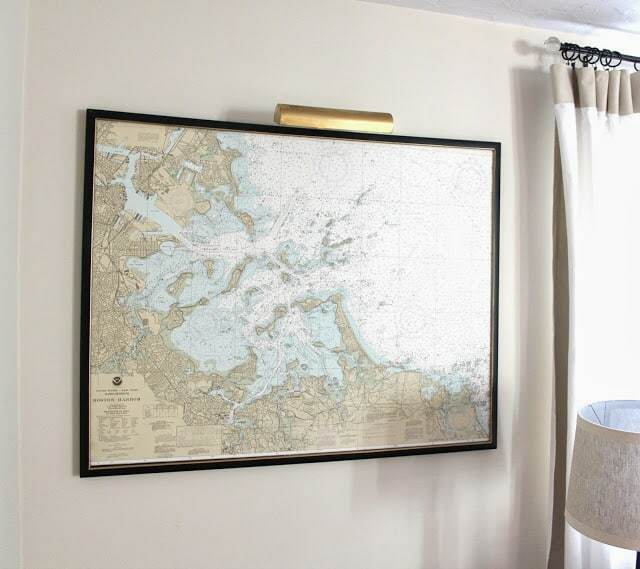 I actually did this map project over a year ago for my living room, but considering that my kids asked for “non-breakable stuff” on the walls of the basement (so they won’t get in trouble for breaking anything during a mad game of knee hockey or Spikeball) it made sense to use the map, which is framed without glass, down there. Also, the map fits perfectly into the “places” theme I am using in this space. 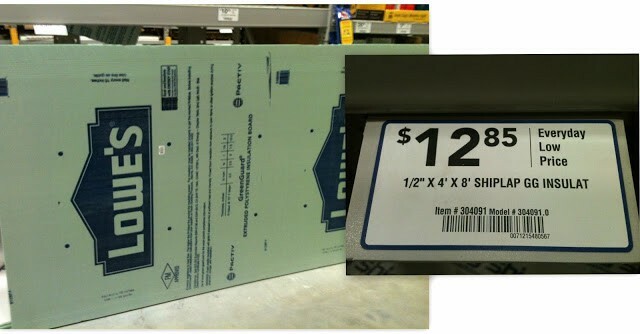 You have surely seen tutorials (like this one at Sugar Bee Crafts) that use sheets of insulation for mounting photos printed on engineering paper at the likes of Staples. 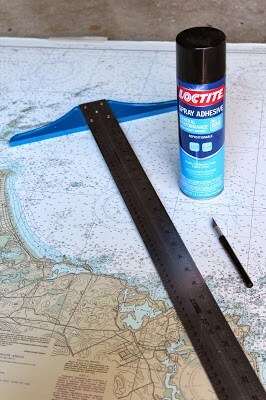 I used this same method to mount a nautical map of Boston Harbor. The most important thing you’ll need for this project? – ANOTHER PERSON to help you! or this one, which for $3 more was much sturdier. Keep in mind this is a HUGE sheet of insulation – 4 feet by 8 feet – that I mounted 2 large maps on, with plenty left over for another project I’ll be sharing with you soon! 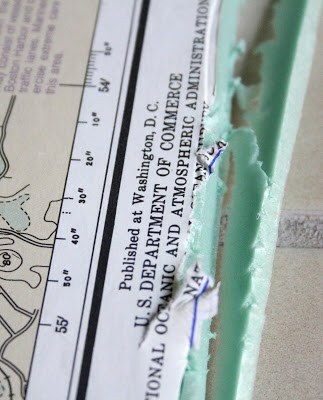 If you don’t want to frame your map: cut your insulation to the exact dimensions of the map (see Step 1 below) and then paint the edges and a bit of the front. DO NOT USE SPRAY PAINT TO PAINT YOUR INSULATION. I read in the tutorial at Sugar Bee Crafts that spray paint causes the insulation to disentegrate. Brush on craft or wall paint in your desired color. After the paint has dried, continue to Step 2 below. painting the edges first is not necessary. 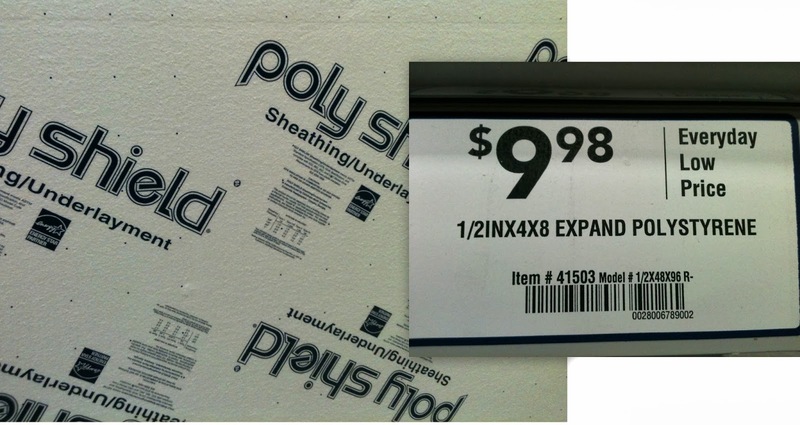 1) Cut the insulation to the exact size of the map. To do this, measure and mark the insulation, then use the T-square as a guide and SCORE the insulation with the utility blade. Next run the blade along the score mark again, firmly and making sure the blade is all the way through the insulation, pushing the blade against the T-square as you go to make a nice straight line..
2) Unroll your map and roll it up the opposite way so it does not curl anymore. You may have to roll your map one way and then the other a few times to knock the curl out of it. Ideally your map will be almost flat before mounting. 3) Spray the insulation with adhesive in a well ventilated area (preferably outside on a non-windy day). Wear a mask when spraying – spray adhesive is stinky and not good for you to breathe in! 5) Use a brayer or a silicone spatula to gently push air bubbles to the sides, working from the center out. *Note: I used the less expensive polystyrene molding the first time I made a frame with corner trim. 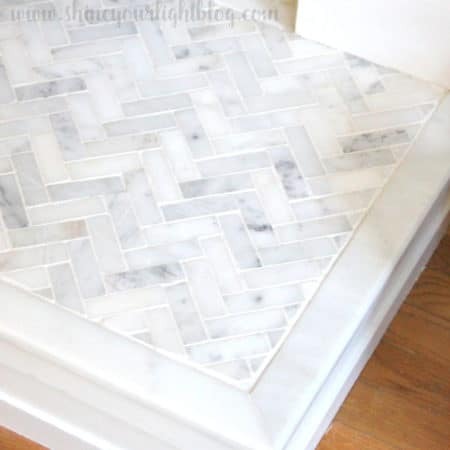 DO NOT USE polystyrene corner molding to make a frame! – it’s flimsy and hard to cut miters perfectly. Buy the more expensive wood corner molding and your 45s will come out so much better. 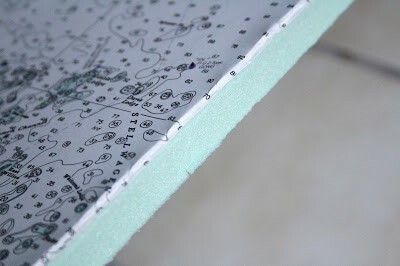 1) Measure the sides of your map and cut corner molding accordingly. 2) Paint the trim. I used black spray paint for this step. 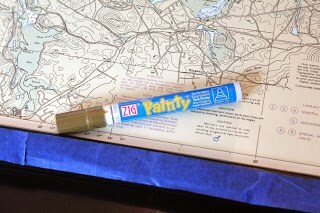 3) Use Gorilla Glue or an epoxy to attach the frame pieces to your map. 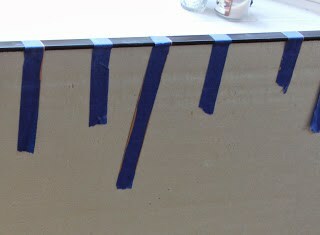 4) Use painter’s tape to hold the corner molding in place until the glue dries. 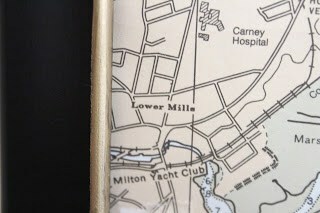 5) Optional: after my map was all framed, I taped off the molding and adding a bit of gold the inside edge with a paint pen for an extra little detail. This is a really professional frame job right here folks. 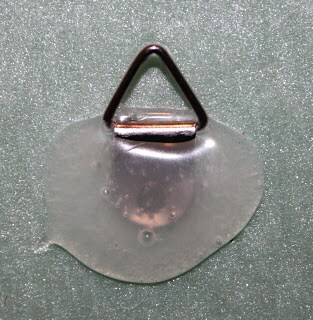 Since the insulation is very lightweight even with the frame on, I simply used two dots of hot glue with a triangular picture hook, as hanging hardware (triangular hooks are widely available at hardware stores and even the grocery store!). If you don’t have one of those hangers handy, you can also use a paper clip!! (Measure the spots where you will put the dab of glue first, so they are the same distance from the top of your map.) When the glue dried, I simply measured and banged nails into the wall, and hung the map, easy peasy. This hanging hardware has worked like a charm on this lightweight piece of art! It’s still holding on securely almost a year later. I think the map blended in too much in my blah living room, but imagine it on a deep dark delicious charcoal basement wall! No sneak peeks…..I’ll show you the big reveal next week for the wrap up of the One Room Challenge! Happy Halloween all you witches and goblins! 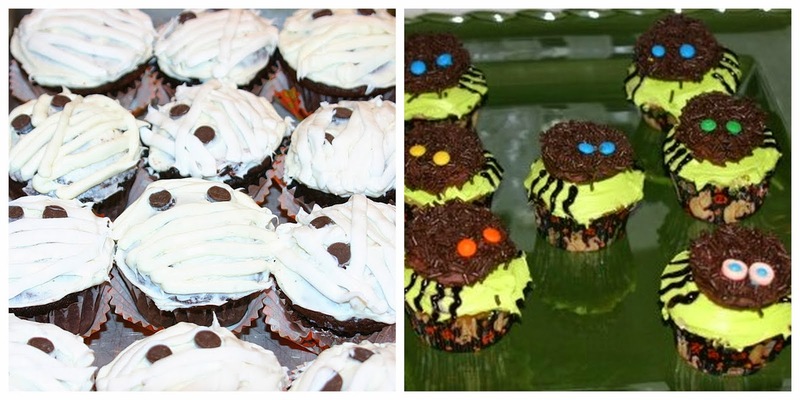 If you’re looking for a fun last minute Halloween treat for your family, try these quick and easy mummy and spider cupcakes that I posted about last year! The map looks great; looking forward to seeing your reveal! Congrats on your Sox! What a fabulous project, I have a think for maps and love the looks of this one! 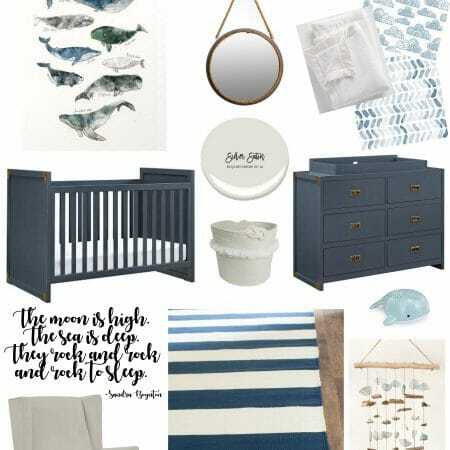 Just pinned this because a big ole framed map is definitely in my future. Love how yours looks. And I can attest that spray paint disintegrates the insulation – I tried using spray adhesive when I was using that type of insulation to create a bulletin board and it didn't go so well! Have a great Halloween! such a great idea- looks amazing! and way to go sox!!! I love the creativity in this framing project. It looks amazing and will sure be stunning against the dark wall in the basement. Congratulations BOSTON!!! Truly, you guys deserve it after one helluva year and the fact that the SOX were just so darn good!!!! That map looks so cool and love the way you framed it Lisa, thanks for sharing, I bought a huge ready-made frame to put a map in before and it was a total failure, the map was just too big, so I had to cut out some countries on the side to make it fit!Pretty bad, your look way better and with perfect fit! Congrats!! So fun to see your team win!